* Includes 30 soft molecular foam rollers - 6 petite, 6 small, 6 medium, 6 large, and 6 jumbo. * Steam conditions as it curls. 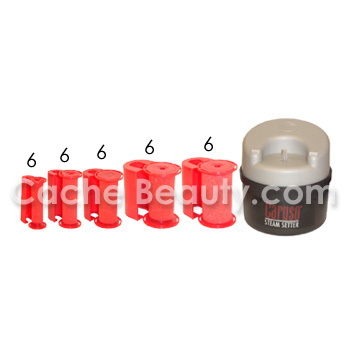 * Quick & easy: sets in 5-10 minutes, or to achieve the 30-second curl, blow-dry hair with rollers to evaporate moisture. * Volume & curls last for days. * Perfect for all types of hair. * Great for hair extensions & wigs, natural & synthetic!